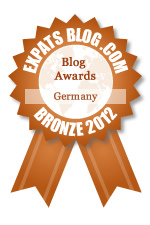 ExpatsBlog.com Expat Blog Awards 2012: Germany Bronze Award! This blog won the Bronze Award for best expat blog in Germany! I have been following this blog since before I moved to Germany. She shares insightful information about getting settled, and I reference this blog often before I stress myself out about something I don't know or understand. She saves me, and many others like me, the headache of trying to figure stuff out. Definitely a "must follow" for those wanting to know more about life in Germany, and specifically being a military member or dependent in Germany. I also enjoy her instagram feed! I was terrified knowing we were moving to Germany. On a websearch, I found Life Lessons of a Military Wife, and she has been the Bible for me and my family! I can't imagine life without her blog and before I do anything, I look to see if she wrote about it. She has saved us so much money and time and stress and everything. She is a HUGE resource for anyone wanting to travel and live in Germany and to be successful. I stumbled upon this blog after I had been in Germany for about a month. At the time I felt lost, homesick, and in a lot of ways hopeless. Being so new to the army life, and not really feeling accepted or helped by many others out there was hard. Having our first duty station in Germany was hard. After finding this blog I felt a lot better. Someone else was dealing with I was! I only wish I found the blog before I had done our whole PCS here all by myself! Oh well now I know:) And now I use this blog to look for things to do and get information that seems like basic knowledge to other wives. (When your husband joins the army, or you marry a man in it there should be a welcome to being an army wife class -- seriously!) I still miss the constant sunshine our home state offers, but with this blog I feel less alone. Most importantly it helps me feel empowered to go out and do things. Anyone moving over seas, or even just married to a solider I think should follow this blog. There is a plethora of information! This blog contains a wealth of information for newbies as well as oldies. I refer to the archives regularly. Thank you so much for all that you do for me as well as for the military community. I found this blog while preparing to PCS to Germany. I can't emphasize how helpful it was to get everything organized, to help plan for eventualities, etc. There is a little bit of info on most everything under the sun having to do with moving to Germany with the military. She's also very helpful when people ask her questions, and she will make a post about them because that information will in turn help others. The military spouse writing this blog shares openly and honestly about solutions to challenges that occur for troops/families living overseas. The information, videos and links she includes are no doubt helpful to other expats as well! She offers cultural insight, encouraging perspective, and helpful information to make daily expat life easier, relieve a bit of culture "shock", and save time and money. I love that she invites others to add thoughts/ideas to her blog. I refer others to her site often, and am grateful to have found it! I am so happy to have found this blog and I recommend it to everyone I meet. She posts great information about living in Germany, Belgium, and Europe in general. She's a wealth of knowledge!! I love all the great information that is provided on this blog!She always has something to do and something to share. Thank you!!! This is the best blog out there for safety, money saving, information and ideas for travel. I love how she researches all articles and makes it a blog for several people to enjoy. This is a must have for new families in Europe. This was a great blog to follow when I lived in Germany. I found so much useful information! Wonderful blog, that I have referred friends to for all sorts of helpful tips about living in Europe. Can't recommend Life Lessons of a Military Wife enough! I've ventured unto this blog a year before we moved to Germany. All of my questions were answered right away by the blogger and the other subscribers as well. They have helped me a lot from moving to settling here in Europe. Also whenever we travel somewhere I would email her and ask for her past experiences and if she has any money saving tips. She is the most helpful person one can ever find. I told my husband one time that the US Govt. should hire her to do Orientation classes on US bases around Europe. Yes that's how good she is. Thank you !!!! Found that blog through the facebook .There are a lot of information,helpful tips and life lessons for those who moving in Europe. I wish I founded that blog before we move here in Germany,it would be much easier for me and my family to adjust life in Germany. I am definitely recommending to follow that blog. A must read for Military Families in Europe. Love it, makes life in Europe much easier. I Love this blog! I came across it first when my now husband was thinking about joining the army (he didn't due to the changes in tattoos before he lost the weight to join). Now that we're headed over with my in-laws on their new assignment, it has been a godsend. She lists practical things you need to know, that you only think of if you've owned a house before or have ever had to run a household (like how houses are heated to what to expect from your landlord). While it is military focused, I would highly recommend her entire blog for anyone looking to move to Germany.